In the thorny world of spirits and food mixing, where suggested pairings often fail miserably, one gin brand is making great strides ahead. 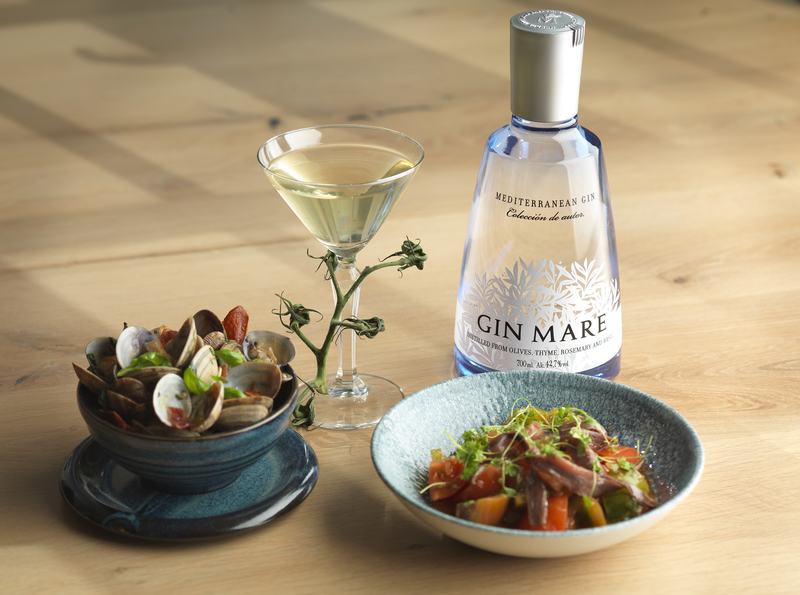 Gin Mare, the distinctive Mediterranean gin brand with botanicals that include thyme, rosemary, basil and arbequina olives, which results in a distinctively savoury flavour profile, has been working with top chefs for years in fascinating ways. From Albert Adrià, to Mark Hix and José Pizarro, plenty have explored the gastronomic edge of this unusual gin. But why? ‘It really works with food,’ enthuses Stuart Bale, a top drinks consultant who often creates Gin Mare drinks to pair with chefs’ menus. ‘When I first came across Gin Mare when I was a bartender, I didn’t really think it tasted like a gin. It’s recognisable as a gin, but it’s out of the stratosphere. I realised that you could apply it in different ways. One of the first chefs to work with Gin Mare was Ángel León, the proprietor of two Michelin-starred restaurant Aponiente in Cádiz. Known as ‘the chef of the sea’, he’s worked out how to grow plankton, and the innovation led to a particularly memorable G&T, which saw sachets of dehydrated plankton turn the drink a distinctive green, and give it a further marine-like salinity. Since then the brand’s work in the UK alone has seen Gin Mare Martinis sold alongside oyster platters at the Richmond restaurant in Dalston, and a G&T ice cream parlour created in the Hoxton Hotel. Mark Sargeant created a Gin Mare seafood menu at Rocksalt, while Hix even used it to make a jelly shot recently, combining it with wild strawberry for a delicious spiked dessert to end his menu. For all of these projects, Bale worked alongside the chefs, turning out riffs on Martinis, refreshing coolers stuffed full of melon balls, and twists on the Red Snapper (the gin equivalent of a Bloody Mary). So, what’s best when you’re trying to pair gin with a meal? It’s tricky to pair neat spirits with food, as the high ABV often obliterates delicate flavours in the food. This is where cocktails step in – drinks with an ABV similar to wine are ideal, and can incorporate ingredients that play off both the notes in the spirit and the dish that the drink is accompanying. He also suggests thinking about the texture of the food you’re eating as well as the flavour, but admits that creating pairings can be a ‘minefield’, because sometimes you need contrasting flavours rather than complementary ones. Don’t be disheartened if your spirituous concoction doesn’t sing with a dish, however – not all food will lend itself to gin cocktails, or vice versa. Bale recalls how Pizarro decided to bring out a bottle of Rioja to accompany one of his dishes instead. ‘You don’t want to force a square peg through a round hole,’ he laughs. Stir over ice, strain into glass and garnish. Put the ingredients in a shaker, shake hard without ice, open and add ice, shake again, then strain into the glass.